Do you want an easy way to share photos with others? If so, you might consider using Dropbox. Dropbox lets you share photos with other people, even if they aren’t Dropbox users. 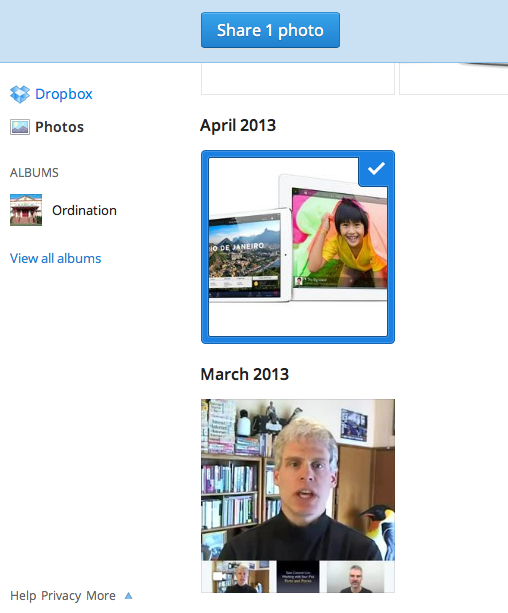 Also, Dropbox allows you to quickly create web-based photo albums which can be shared with others. I used to use MobileMe’s Photo Gallery feature, but Apple discontinued this service when they transitioned from MobileMe to iCloud. Dropbox’s photo sharing features aren’t as elegant as Apple’s, but it’s what I tend to use these days. I’ve recommended Dropbox previously. It’s a versatile, free (or low-cost) service that let’s one share documents with other Dropbox users as well as non-Dropbox users. It’s an easy way to share a file that is too large to send via email. Recently, Dropbox has enhanced its photo sharing features. Here’s a quick introduction to how to create a photo album and share it with others. These instructions assume you’ve already signed-up for a Dropbox account, downloaded and installed the Dropbox client application and logged into your account so you have a Dropbox folder on your Mac. Create a folder inside your Dropbox folder and place some photos inside this folder. Visit the Dropbox web site and login to your account. Click the Photos button that appears on the left-hand side. Dropbox will display all of the photos in your entire Dropbox folder, not just the photos that you put into a folder in step 1. Click on some photos to select them. Notice that a blue border appears around the photo, as depicted in the picture to the right. In the window that appears, enter the email address of your desired recipients, click the checkbox next to Save As Album, then click the Send button. The photo album has been created and your recipients have received an email containing a link to the photo album. If you enter your own email address as one of the recipients in Step 7 then you’ll, of course, get a copy of the link to the photo album. Then you can easily send it along to other people in the future. If you want to subsequently update the photos in your photo album you can do this, but you’ll end up essentially re-creating the album, then re-sharing it. This will produce a new web page address. You can stop sharing your photo album by visiting your Dropbox’s Album page, selecting an album, then clicking the gear icon. This gives you the choice of renaming, deleting or unsharing your album. 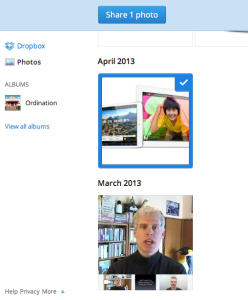 More details from Dropbox’s photos and album features check out its Help pages. Read more about DropBox, photo album, share.